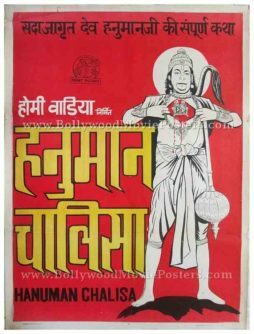 Old hand drawn Bollywood poster of the Indian mythology film, Hanuman Chalisa (1969) for sale. This is an actual surviving vintage Bollywood poster of the 1969 Hindi mythological produced by Homi Wadia’s production house, Basant Pictures. Printed and circulated a few years after the original first release of the film in the 1970s, this old hand drawn Bollywood movie poster was printed for publicity of the film but never ended up being used. The poster features a memorable scene from the film where Hanuman tears open his chest to reveal an image of Rama and Sita in his heart. Hanuman Chalisa is a 1969 film produced by Basant Pictures (Homi Wadia).